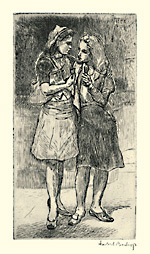 Delayed Departure - - 1935, Etching. Teller 18A. Proofs only, 1985 edition 50. Signed in pencil. Image size 6 7/8 x 5 3/4 inches (175 x 146 mm); sheet size 13 1/8 x 10 inches (333 x 254 mm). A fine impression, on cream wove paper, with full margins (2 1/16 to 3 13/16 inches), in pristine condition. A printer's proof from the 1985 edition. Printed by Stephen Sholinsky, with his blindstamp in the lower right sheet corner. Published by Sylvan Cole Gallery, New York. Single Strap Hanger - - 1940, Etching. Teller 25. Proofs only, 1981 edition 25. Signed in pencil. Image size 8 1/4 x 3 3/16 inches (210 x 81 mm); sheet size 13 x 9 1/2 inches (330 x 241 mm). A fine impression, on cream wove paper, with full margins (2 5/16 to 3 1/4 inches), in pristine condition. A printer's proof from the 1981 edition. Printed by Stephen Sholinsky, with his blindstamp in the lower right sheet corner. 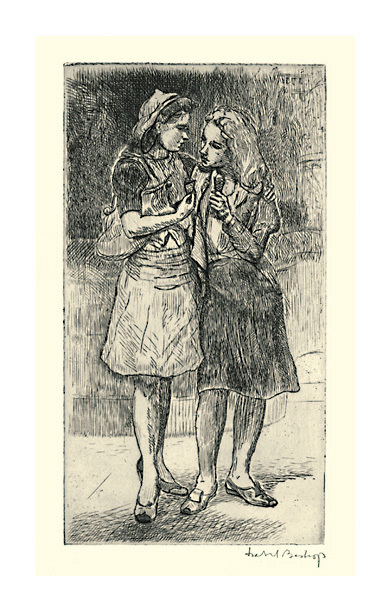 Friends - - 1942, Etching. Teller 29. Edition unknown, 10th state of 10. Signed in pencil. Image size 7 5/8 x 4 inches (194 x 102 mm); sheet size 13 x 9 inches (330 x 229 mm). A superb impression, on cream wove paper, with wide margins (2 1/8 to 3 1/8 inches), in excellent condition. 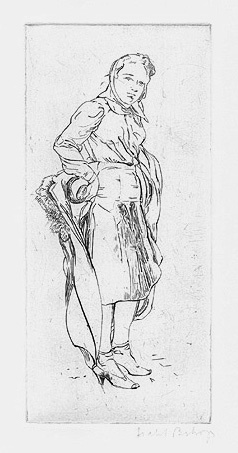 Collector's of American Art, Inc. stamp in the bottom sheet edge, verso. "The plate for this subject is steel faced and cancelled, indicating that it may have been editioned. However, only unnumbered proofs printed by the artist are known to the author." –Susan Teller, Isabel Bishop: Etchings and Aquatints, 1985. Collections: Whitney Musuem of American Art, Library of Congress. 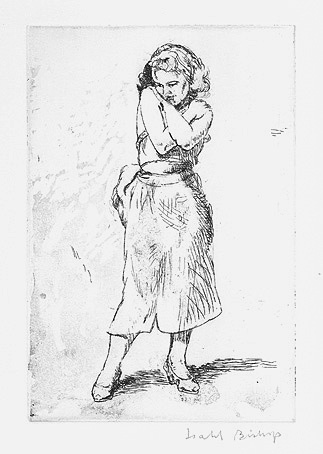 Young Woman with Kerchief - - 1943, Etching. Teller 33. Proofs only, 1981 edition 25. Signed in pencil. Image size 6 3/8 x 3 inches (162 x 76 mm); sheet size 13 1/8 x 10 inches (333 x 254 mm). A fine impression, on cream wove paper, with full margins (3 1/8 to 3 1/2 inches), in excellent condition. 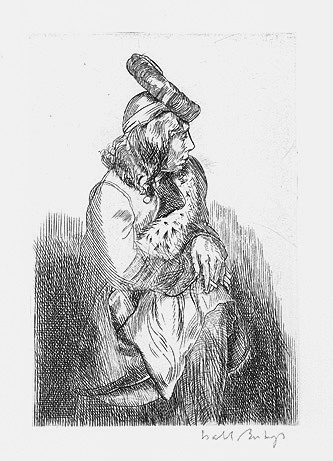 Seated Woman with Hat - - 1949, Engraving. Teller 44. Proofs only, 1981 edition 50 (second state). Signed in pencil. Image size 5 7/8 x 4 inches (149 x 102 mm); sheet size 13 x 9 1/2 inches (330 x 241 mm). A fine impression, on cream wove paper, with full margins (2 5/8 to 4 1/8 inches), in pristine condition. 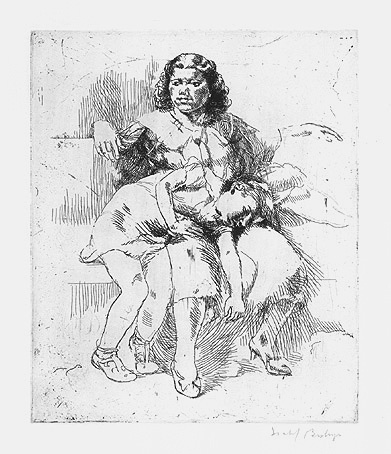 Sweet Sixteen - - 1954, Etching. Teller 49A. Proofs only, 1985 edition 50. Signed in pencil. Image size 5 13/16 x 4 inches (148 x 102 mm); sheet size 13 x 10 inches (330 x 254 mm). A fine impression, on cream wove paper, with full margins (3 to 4 inches), in pristine condition. Printed by Stephen Sholinsky, with his blindstamp in the lower right sheet corner. A printer's proof from the 1985 edition.